Welcome to my stop on your weekend hop! I hope you are finding inspiration from the cards, comments, & card-makers to join and support this mission! You too can help a hero, with just the little bits of paper you may already have at home! ﻿ The card I'm sharing with you today is a quilt style card. Its made by taking little strips and gluing them to a sheet of card stock. Then I ran the sheet through a texture folder, and followed with a die cut. Its then layered onto a card base which has "Missing You" printed all over the background. 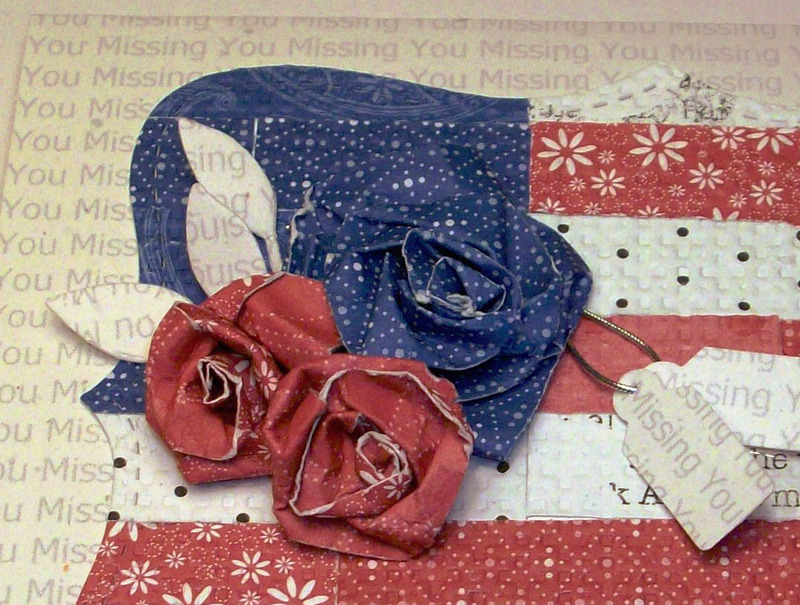 I added a few paper roses I made from more strips, and two tiny tags - also printed with "Missing You". I hope you'll make time to visit Operation Write Home's web pages and Facebook page - and share them with your friends and family!! OWH truly does works of the Heart, and your help making cards and/or donating to cover postage costs can make a difference. Read how something so simple as a card can connect some of our National Treasures - our Troops - with their loved ones who serve here at home! Thanks for visiting & enjoy the Operation Write Home Memorial Day Blog Hop! Wowza, what a gorgeous card!!!! I love it, so very, very creative!! OMGosh! 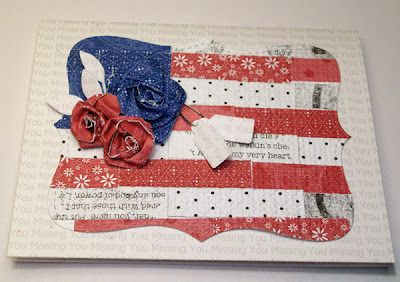 LOVE your patriotic quilt card. It's gorgeous. Angela, I like everything about your card - the design is great. Your folded roses are really nice. I made over one thousand of them for my daughter's wedding, so I really appreciate your skill. Blessings. I love this! Those tiny tags re one of my very favorite things. Thanks for sharing! Wow!! This is so beautifully done. I love it! Excellent job with the quilted look! Your roses are terrific! Wow! Amazing card, hope you don't mind if I case it! Absolutely love the flowers! Great card too! I love the quilted card AND the beautiful flowers! Your hard work really shows! Blessings! I love the color tones & those flowers are great! wow!!!!!!! that is the most creative card i've seen in a looooooong time!!! it's absolutely amazing!!!!!!!!! i love love love everything about it!!! wow!!!!!!!!! Very pretty - love the roses, I need to learn to make my own. I also like the technique - another new technique I need to try. Wow- that paper is fantastic. You've really shown off here- the paper flowers, tiny tags (love the metal attachment! ), and overall execution. You should be proud of yourself. this is a beautiful card! i love your papers, your technique, your flower, your sketch. consider me a follower! I love the flowers! Great card (as always!) Happy Memorial Day! Your card is stunning!! Wow wow wow. Yolanda told me about it while talking and said I had to go see it right at that moment. LOL. Beautiful job as always! What a great card. I just love this flowers. TFS. your card is so cool! I love the quilting and beautiful flowers. Wow, what a beautiful card! Happy hopping and have a great Memorial Day weekend! Wonderful card. Love the papers. This has to be the most stunning and the most moving card I have seen yet! God bless you and may He also bless the soldiers we revere. Outstanding card! I love the flag and the flowers are great!!! what a lovely card, love the elements an dthe techniques you used. Excellent flag card. It has a soft look and yet is bold. Thank you for sharing on the blog hop. LOVE this card! The technique is terrific and I need to know how to make those beautiful roses. Wow the close up detail of this card is just stunning! I would so love to see a tutorial on this beauty! Thanks for supporting OWH and hopping this weekend. Truly beautiful card. Have a wonderful weekend. Super stunning card and you have inspired me! I love that shape and embossing. I love paper so loke to make paper "quilts" using my inchie. TFS!!! This is a totally cool card--love the quilted flag and those fab paper roses. . . .
What a delightful card! Beautiful flowers! And I am now a follower of your blog. So very nice to meet you! Thanks for sharing your technique with us. Love the card and the flowers are DIVINE! Love the touch of the roses on this card! I love the roses! I especially like the dog tags that say missing you! This is a beautiful card, Angela. I love the sweet country style! This is simply gorgeous. I love those flowers, and the missing you paper. There's just so much to love here. Thank you for taking part in the hop! Love the quilted look of your card. Gorgeous work of the heart. What a gorgeous card. Love the paper and the flowers. Everything. That sounds like alot of work, but the results were worth it. I was amazed. TFS. Gorgeous and creative! Thanks for supporting OWH and all our Heroes. Your card is amazing and one of my favorites! And that's saying a lot with all the talent we're enjoying on the hop. I would LOVE to see you make this as a tutorial, including those lovely paper roses! Great job. Lovely card, I am awestruck by your talent. Just beautiful. Quilting technique. What? Wow, I've never seen this technique before. It is amazing. stunning card. I like the missing you paper. And this beautiful roses on the red white and blue paper. This card is totally stunning! Great use of the texture folder, and that design paper in the background is perfect for OWH cards! Do you happen to remember who makes it? I'd love to get some. What a beautiful card!! The details are amazing! I love those paper roses! I'm lovin' what you've done w the label nestie and flag motif - gotta CASE and will link back when I get to it! thanx for the inspiration! beautiful! I love how you did the strips in flag colors and your roses are just gorgeous! Thanks for sharing! Beautiful card Angela!! love your designs! Angela, that is an amazing card!!! I love everything about it!! Thanks for sharing how you made it!! Very beautiful with the patterns and textures. Your paper roses are so elegant with the stripes. And thank you for sharing your thoughts about our troops, their families, and Operation Write Home. Your card and talent are truly amazing. Thank you so much for sharing with us and our service men.Blessings to you and yours for your generous and loving spirit.